Jigsaw puzzle games for kids can be played by children of all ages. They are puzzles designed just for toddlers, usually with large wooden puzzle pieces. They are games for preschool kids and also for children that have reached school age. Puzzle games for older children usually include a larger number of smaller pieces and more complex color patterns. Puzzle games have many benefits. They can improve basic skills such as hand-eye coordination as younger children manipulate small objects. Children can also acquire spatial skills as they have to visualize a puzzle piece and to mentally rotate it to find the accurate fit. They also promote the child's brain development. For example, they can increase children's perceptual skills, their ability to process information, analyze and solve problems. Puzzle games can also boost the child's self-image as he or she completes the puzzle. Ravenburger African Animals: the Ravenburger African Animals is made of large pieces and from the highest quality material. It features a serene Serengenti scene of zebras, monkeys, elephants, etc, perfect if you want your little one to learn about animals. For school age children (ages 6 and above), we recommend puzzles that can teach about history or geography. For example, as you child completes a puzzle with a map of the United States, he will familiarize himself or herself with the geography of the United States. A puzzle can also familiarize a child with a historical event. 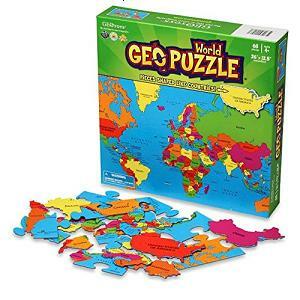 We recommend the World Puzzle by GEO Toys. It helps kids learn about world geography, learn about countries and cities and it won the Dr Toy Award.